Can I use other brands of PLA Filament with my Inventor? Yes! The Flashforge Inventor II(s) will extrude any 1.75mm diameter PLA 3D Printer filament. As with any printer or filament, mind the golden rules - cheaper is not always better, and filament that gets old/moisture laden will exhibit very odd printing behavior. The spool well in the back is designed to be used with PLA filament directly from Flashforge. More can be purchased at the websites below. 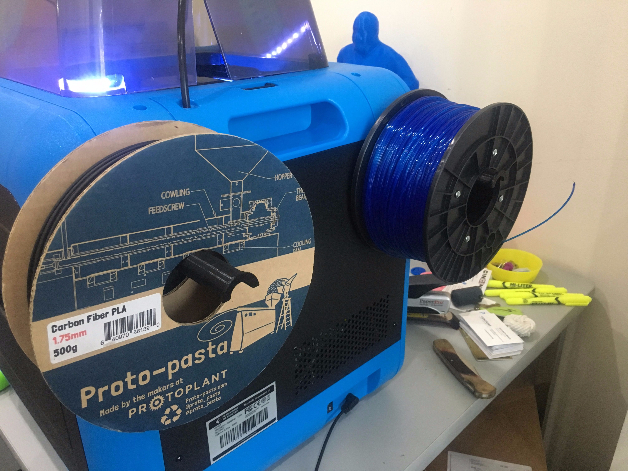 To utilize other larger/smaller filament spools, print your very own spool holder! This one is designed to mount off the back of the printer, using pre-existing screws. All you'll need to install this is a Philips (+) head screwdriver. We recommend printing it at 40% Infill or above for a nice strong print. You can also explore options like using 608 Skateboard bearings and printable spool holders or buying an inexpensive lazy susan to sit behind the printer. If you receive a FILAMENT ERROR it's because the printer is looking for the filament to feed through the sensor in the normal cartridge well (the removable piece in the back). You can fix this by going into TOOLS > SETTINGS and then scrolling down to "Filament Check" and making sure it's turned OFF. Don't try this at home! Longtime Polar Teacher Doug Noxsel and his students created a jig to wind Polar filament onto Dremel spools.